As a child, I never really understood how close to the border we lived. But Google Maps put it in perspective. We lived considerably less than a mile from the U.S.-Mexico border, defined by a river, the Rio Grande. Maybe the proximity to the border could explain, at least in part, my affinity and reverence for Mexican-American heritage (and my odd wish that it was my heritage). I lived at 1307 West Saint Charles Street in Brownsville, Texas for the first years of my life. I don’t know precisely when my parents decided to move away from Brownsville in favor of Corpus Christi, one hundred-sixty miles north. But it was around the time I was five years old. I don’t remember the move. In fact, I don’t remember much about my first few years of life. I’ve written many times before about the fact that I have very few memories of my childhood. That absence of childhood memories has always troubled me, though I can’t say just why. But it has. Perhaps it’s because, knowing that I have exceedingly few childhood memories, I question whether those few I have are real. They may, instead, be stories about certain circumstances I heard so many times that they evolved into artificial “memories” I think are mine. My sparse recollections may well be accidents that emerged from family lore. 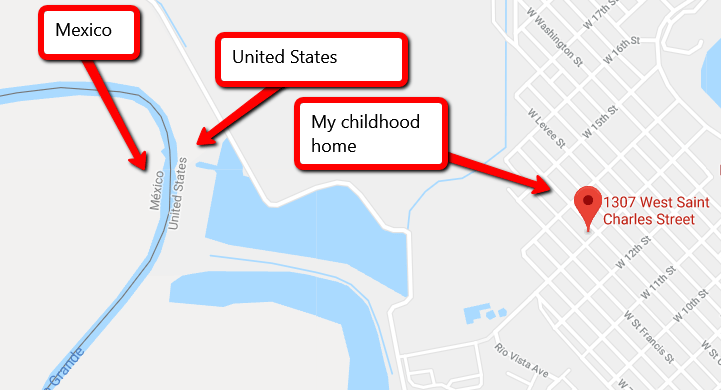 But I do remember my childhood street address, though occasionally I’ll forget the street numbers for a short while, the way I did recently when a friend told me he and his wife planned to travel to Brownsville soon. I gave him the incorrect address, then corrected it moments later. I don’t know why I gave him the address, other than in the hope he’d drive by my childhood home. If he were to do it, he’d find a little house on the corner of West Saint Charles and Thirteenth Streets. A covered bus stop sits on the corner on the east side of the house. If memory serves, which it probably doesn’t, the bus stop wasn’t there when I was a child. Or, at least, it wasn’t covered. But maybe it was there all along. I doubt it. Public transportation in Brownsville may well have been years in the future when I was a child. I’ve never had a particularly strong urge to know details about my childhood, even though the paucity of memories of that time of my life is disturbing. But, lately, I’ve become more curious. It occurs to me that, aside from family stories and photos and the like, I might learn more by doing some real research. For example, I might examine old newspaper stories about events that took place in the Rio Grande Valley during that time or, if I were to travel to Brownsville, I might look at Cameron County records available at the courthouse. And, if any of the people who knew me or my family from that period are still alive and willing, interviews might reveal bits and pieces of my past that family lore don’t. As much as I think family lore is a value source of information, I know with certainty that recollections bend and sometimes break with time. I know that memories bend toward truths we want to find rather than truths that don’t paint the past with such positive brush strokes. My life as a border child is a fuzzy, faded, incomplete memory. I want my own memories of that time, not recollections of my older brothers and sister. But perhaps it’s impossible to prime the pump at this late stage. Maybe even looking at old pictures and reading old accounts of visits to the pool El Rancho Grande Motel (was that the name of the place? ), where my folks, I think, paid a membership for access to the pool, won’t work to get my memory working. We’ll see. Perhaps. One day. This entry was posted in Memories, Mexico. Bookmark the permalink. Of course! The trip would t have seemed compete without the stop! And the grapefruits are a highlight of this trip! Gracias, amigos! I appreciate your taking the time to see the hut where I grew up for a few brief years and thanks very much for the link to the photo of El Rancho Grande! You are good people! I hope you’re enjoying your time in an around Brownsville. Lovely grapefruits picked for your breakfast juice, it seems to me! Thanks for sharing the address so that we could get a peek into your formative years. Or, at least into what the place where you spent some of your formative years has now become!